Italian Greyhounds may look just like a tiny version of the larger greyhound, but they are quite different in many ways. They can be fantastic pets for the right family but do have some breed characteristics that often get them sent to shelters. Do your research on the breed to make sure it is the breed for you before succumbing to their cuteness. 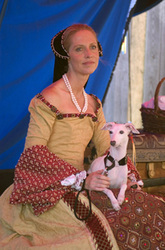 Italian greyhounds have been depicted in art from the 11th century in Italy, France Spain and Great Britain. The breed was referred to more than just about any other breed and called a “small or miniature greyhound” at that time. It was most often painted in white or pale colors. The breed, also known as an “IG” actually originates in the Far East and the Roman soldiers often brought them home with them when they returned from campaigns. Mummified remains have been found in ancient Egypt. IGs are usually 13 to 15 inches at the shoulder but a few are taller. They should weigh between 8 and 18lbs. If you like to fatten up skinny dogs, this isn’t the breed for you. Italian Greyhounds should stay thin with some vertebra showing. If allowed to eat as much as they want, they may double their weight and get up to a very unhealthy 30lbs. At this weight they resemble pot bellied pigs and are very unattractive and unhealthy. If taken care of properly, their lifespan can be 14 to 15 years. They have few genetic problems. They aren’t quite as fast their larger cousins, the racing greyhounds, but do reach speeds of 25 mph. Italian Greyhounds come in a variety of colors like larger greyhounds but never brindle. Typically a clean breed, they don’t have a doggy smell and have very short, sleek hair that doesn’t require much grooming. A wipe with a damp cloth is usually enough. Baths are rarely needed. They do shed even though their fur is very short. Nail trimming is necessary. Like most small dogs, IGs tend to get gum disease and lose teeth as a result. Frequent brushing and dentals are necessary to keep the bad breath at bay. IGs are thin and shorthaired so tend to get cold easily. They are strictly indoor dogs for this reason. They love to sleep under the covers with their owners and to sit on laps covered with a blanket even in warm weather. Many enjoy wearing coats too. They have an extreme dislike of cold wet weather and often choose to relieve themselves indoors in bad weather. Even when an IG is not cold they are likely to shiver. They shiver when excited, scared or hungry and sometimes for no reason at all. The breed loves human contact and wants to be touching you most of the time. If you want a lap dog this could be the breed for you. If you don’t want a needy dog or don’t like dogs on the furniture look for another breed. An IG that doesn’t get enough human contact will not thrive. Italian greyhounds can be a bit fragile with their long legs and tails. Those are the most likely areas to get broken. It costs thousands of dollars to have a tiny IG leg plated and is usually necessary to get the bone to heal. Casts and splints rarely work because of the length of the bone and the force put on it. Because of this the breed is not suitable for a home with small children that could step or fall on it or pick it up and drop it. Rough or careless play can cause harm to them too. They may not do well in a home with larger dogs that may play too rough either. Italian greyhounds love to run and need more exercise than their larger, calmer greyhound cousins. This is especially true of younger IG’s. They do have a strong chase instinct similar to larger greyhounds and must be kept on leash if not in a safely fenced area. If you can’t provide them with a large fenced area to run and play in, you might want to consider a different breed or consider adopting an older IG. This is one reason that they aren’t great dogs for apartment living. 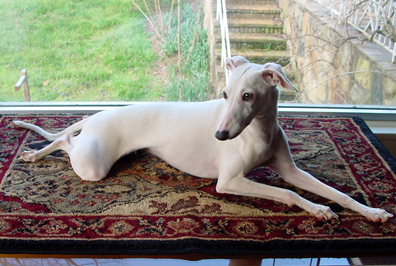 Italian Greyhounds are bright dogs that learn quickly but they can be a little nervous and high strung. They aren’t often aggressive but are nosy and tend to bark easily so are likely to warn you when visitors arrive. This is another reason they may not be the best breed for apartment living. Although they tend to be good watch dogs they are not guard dogs. They tend to be aloof with strangers or timid and are more likely to run away when frightened. If you don’t care for yappy dogs, you may want to skip this breed. IG’s are notoriously difficult to potty train if they can be potty trained at all. When they need to go, they need to go NOW and don’t seem to be able to hold it very long. Pair this with a dog that really dislikes going outside on cold or wet days and you end up with a lot of accidents. IGs are not going to be able to hold it all day while you are at work. Owners get around this by installing doggy doors, using puppy pads, or even training them to use a cat litterbox. We can’t stress enough that this breed will have accidents!! If you would ever get rid of dog because of potty training issues this is not the breed for you! The number one reason IGs are sent to shelters is problems with potty training. If you want a dog that is quick to do whatever you tell it, an IG may not be for you. They want to work WITH you not for you and can be opinionated, willful and almost cat like. A few have earned obedience titles but they will never wait on your every command like a Border Collie or a Labrador. If you want a sweet, smart, indoor snugly dog that looks like a work of art , doesn’t require much grooming you may have found the ideal dog. Be sure you can put up with barking, accidents in the house, don’t’ have small children or rowdy large dogs and are willing to provide this dog with plenty of exercise and space to run before adopting or buying an Italian Greyhound.